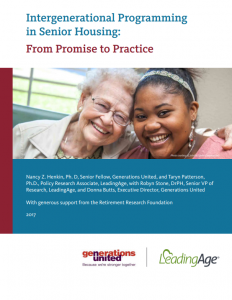 This report describes the findings from a year-long study on the nature and extent of intergenerational programming in senior housing that was conducted by Generations United and LeadingAge, with support from the Retirement Research Foundation. There is a growing interest among senior housing providers in intergenerational programming as a vehicle for connecting residents to the broader community, enhancing well-being for both youth and older adults, reducing ageism, and preparing an aging workforce. The report also highlights challenges and effective strategies for overcoming barriers, and identifies technical assistance needs. Finally, it includes four “Spotlights” that focus on different ways providers can integrate multigenerational activities into senior housing. Most housing sites, with some exceptions, focus on engaging residents in specific activities, rather than employing more general strategies to foster cross-age relationships. Residents engage in both active and passive activities. Although residents in some properties are actively involved in planning and implementing intergenerational programs, most activities are planned by members of the housing team. Lack of time to plan activities with partners due to other responsibilities.